The conventional wisdom about green-screen photo activation says that it needs to be stationary within the footprint and should feature a large well green screen. Today’s green-screen activations however are growing up and moving out in some cases losing the screen altogether. Photos don’t have to be still to be custom anymore thanks to green-screen video and the ubiquitous neon green backdrop can stay at home now too thanks to custom environments and CGI. When it comes to photo activation the Cincinnati Zoo is leaving photos with the gramophones and typewriters. Starting in 2010 zoo visitors will be able to step up to a kiosk and make a digital video of their experiences and memories of their trip to the zoo. Pretty standard right? Nope. Zoo-goers will then be able to choose a custom-designed video background (zoo-themed naturally) in front of which they will appear to be standing. They then get the link to the video emailed to them where the video is available for download in exchange for some personal data. 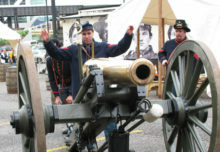 The technology was developed by Cincinnati-based nSixty which hosts the video database. Videos are stored on servers and played through a file sharing website that offers hot links for posting the video link on social networking sites such as Facebook Twitter MySpace and Digg and will include a comment and messaging area so visitors can post comments on the videos. Crikey! The kids-focused network just finished a month-long tour to promote the new “Scooby Doo! The Mystery Begins” movie that premiered on Sept. 13. 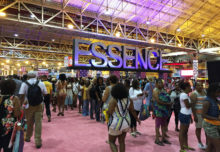 The network activated at some of the largest state fairs in the nation and used a unique digital camera to get consumers in the picture—literally. Forget the green screen this camera designed by PictureU of Atlanta GA integrates the subjects of the photo into pre-programmed backgrounds without needing any particular backdrop at all. Zoinks Scoob! 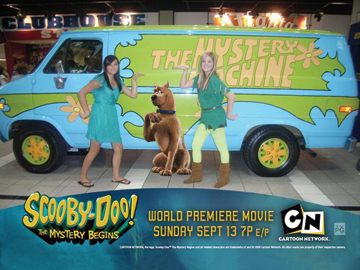 Participants take a photo with the Mystery Machine and the integrated green screen overlay system adds a custom border with the event details and a CGI image of Scooby Doo into each photo. Over the course of the tour the network took more than 6 300 unique photos and printed another 1 200 snapshots (OnTour Marketing Incline Village NV handled).